It took me a while, but I am finally going to tell you about my when my family visited in October. There is much to tell, but I will try to keep it short and give you the highlights. 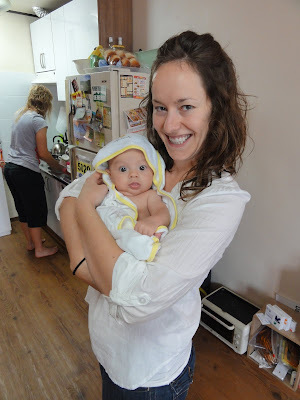 It is official to say that my family has the "travel bug" so I was excited when they told Danny and I they wanted to see what living in Korea was all about. My dad, mom, Abby (sister), Albert (brother-in-law), and Clark (my new nephew) spent about 9 days with Danny and I, living in our 300 square foot apartment, and tried not to admit that they loved the hard mattresses and the one bathroom that we all got to share. A slice of paradise, right here in Korea! Our apartment is definitely NOT made for 6 adults but we made it work. Clark even got to enjoy leisurly baths in our sink! Abby probably got the most attention that week since she was the one carrying Clark most of the time. Who knew that a pretty girl, who is blonde, and who is carrying an adorable baby is the perfect trifecta to draw Korean women from miles around? Really, Drew Barrymore or Nicole Kidman couldn't have done any better. The "famous" Andong Mask Festival was ending the first weekend the fam arrived so we got to take them and show them a real slice of Korea. At any festival or event there are always mascot characters walking around. These mascots represent the "traditional Korean" and the "salted mackerel guy" (yes they has mascots for salted fish). For some reason they loved Abby and wouldn't let go of her for a while. It was the first time that I saw her "mama bear" instincts come in and I saw her go from "Haha, this is funny!" to "If you don't let go of me and my child soon, I'm going to deck you!" 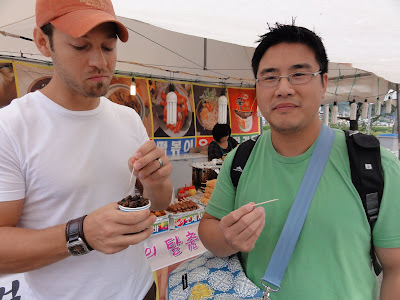 At the festival, Danny finally found someone to enjoy bundaegi with him (thanks Albert), which is boiled silkworm larvae. Yuck. They taste just about at bad as they smell and yet somehow Koreans love them! Danny had 3, Albert had 2, Abby and I had 1, and the rest of the cup went to a very pleased old Korean man who started chowing down when we offered them to him. Needless to say, my mom tried none. Of course, Danny had to pose with Curious George at the festival and try to "outcute" all the other Korean kids... I say he was successful. One day during the week, we went on a drive to find an "artist colony". It was nice to have a rented van so we could explore a little bit and we found this beautiful lake on our way. Both of us have missed our family a lot, so it was so great just to be together... now we just have to get the rest of our family out to visit! Although this isn't really a highlight, I wanted to make sure and show the insane Korean spiders that my family got to see. Huge spider webs are all over, but I think Korea is full of radioactive or mutant spiders because I've never seen them this big! It really was a fear of mine that I would walk through one of these spiders webs because I was sure that they would have a swarm of their friends come attack me, and although spidey-senses would be cool, I like myself the way I am. The guys found some entertainment for a while seeing how close they could get to the spiders and as you can see they all walked away feeling like men being that not one girly scream came from them. Good job boys. Throughout the week we also went to the largest Buddhist temple in Korea, a ceramics village, an apple winery, Emart (twice), a Korean scholar colony, and a bakery about 2 times a day. Although, it doesn't look it from the good-looking family above, I think we all needed a vacation from our vacation after we were done. Well, all in all, it was a great time but we had to say goodbye. The family went back to the land of ovens, Chipotle, and shower stalls and Danny and I had to stay in the land of squid jerky, NO BURRITOS, and bbq dog. Oh well. If any other family reads this: please come and visit and YOU TOO can tour crazy Korea! Exibit A: Danny. I knew he makes halarious faces when his feet are being tickled, but the silent scream that came from his mouth as he put his feet in the pool was priceless. Suprisingly, it doesn't hurt to have fish eating skin from your feet, it kind of feels like a mixture between little tiny electric pulses and a massaging machine. The fish nibble until they find no more skin to eat. I think the funniest feeling is to have little fish swimming in between you toes. Only in Asia. 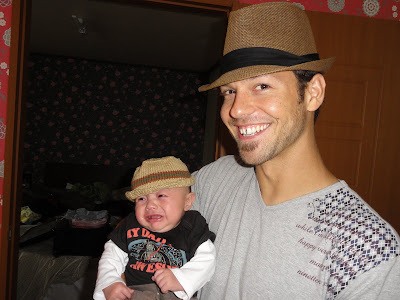 Exibit B: Dad. His face is also priceless and even though you can't tell, this is his second time doing this! This fun activity was done with my parents when they came out to visit in October (Also my sister, brother-in-law, and adorable nephew Clark Kent came as well). I have many things to share about their trip out here but I thought Dr. Fish would be a good way to start. Koreans are interesting because they like to combine strange things sometimes. Eating dog OBVIOUSLY needs to happen in the summer, taking your shoes off and eating at a restaurant matches perfectly, and flesh eating fish naturally fit with drinking coffee! All you have to do is go to a Coffe Namu in Gangnam, Seoul, order a latte and enjoy a fish pedicure. Perfect! What a way to start your day! There are actually 2 pools that you can use. There are small fish and then there are the BIG fish. The big fish are about 3-4 inches and they have a stronger nibble for sure (it still doesn't hurt but it does make you more aware that fish are sucking on your toes). My dad said it was best to start small and then go big, but I might say mix and match a bit. Start small, then go big, then go back to small for dessert. The fish will enjoy the feast no matter how you do it. My feet really did feel smoother when I was done, I got to drink a delicious smoothie, and I got a good laugh from the whole experience, so I might have to insist that America NEEDS to adopt Dr. Fish. No matter what, if you are in Asia, you MUST make this a part of your trip because even though you are leaving a part of your feet behind, you are taking with you some good memories! I didn't think that when I came to Korea I would be getting some farming lessons, but there we were, farming sweet potatoes with one of Danny's coteachers. Danny's teacher who they call "White" took us two weeks ago to his house to gather the crop. I have never farmed sweet potatoes so I didn't really know what I was doing, and I found out some interesting things: Did you know potatoes grow in the ground?! Who knew? (Well probably a lot of people, and I kinda knew but I had never participated in digging them OUT of the ground.) Koreans are ALL about health so just about everyone has some sort of garden or farm, and it's cool because most everything in Korea could be called "organic". We got a TON of sweet potatoes, and Mr. Lee even gave us some eggplant and pumpkin. My coteacher supplied us with a ton of vegetables from her garden this summer, which was awesome, but it was still fun getting our hands dirty and finding those potatoes. Being in Korea has been interesting for many ways, but one reason is that I have gotten to see food in a different way. Everywhere you go you see peppers or cabbage or rice or apples being grown and it makes you feel more connected in a way to the process. Being that I am an official "foodie" I think it has taken my love of food in a new direction. Right now it is rice and APPLE season. Yes, Danny, apples are EVERYWHERE! ; ) I think of all the farms, apple farms are my favorite. You see the trees decorated with the perfect, delicious fruit and if you are in the right place according to the breeze that day, you get to smell what I would consider one of the best smells on Earth. Take in a deep breath of heaven...ahhhhhh. Another unique site is rice being harvested, which I had never witnessed before. The interesting thing about rice is that you need to let it dry out in the sun and what better place to do it than in the middle of the road!? Apparently this practice is illegal, but this fall I constantly had to take new paths due to all the rice drying on the road. I bet the Korean farmers are saying, "Asphalt is the best place because it is flat and warm, so BACK OFF! ...And don't ride your bike through my rice anymore!" Just kidding, I have never been mean enough to ride my bike on their rice, but I have considered it : ) So watch out if you are ever driving in Korea in the fall because around any corner could be a nice spread of rice... and apparently it is not free to anyone who drives by. This picture has nothing to do with farming, but Mr. Lee took us to see this house on our way back from the farm. While historical sites are the same worldwide (boring) this one made me think that living in this old house wouldn't be that bad. Again, I say: Korea is beautiful!